This entry was posted on May 21, 2011, 10:36 AM and is filed under Articles I Probably Shouldn't Have Bothered Writing, Health Tips for An Early Death. You can follow any responses to this entry through RSS 2.0. You can leave a response, or trackback from your own site. wow man, this is pretty cool, i dont normally speak on stage but when i have to perform for my band i get a little stage fright.. Thanks! I don’t know how musicians do it! The thought of that scares me to death as well. I have a hard enough time staying in rhythm with no audience. Outstanding post, but actually terrifying in itself. You have drilled down to its descriptive essence. Ha! I’m sure Newt lost his fear of pubic speaking when he had his soul surgically removed back in the 1980s. Thanks Jim! The worst part of the thing is I really have tried nearly everything and I don’t have any hope it is going to get any better. Hopefully, I’ll at least stop thinking about growing antlers. My Momma always told me that if I was afraid of what someone thought of me…. it was probably closer to the truth that they don’t. Growing up playing trumpet, even in competition, I can relate. The nerves really show bad then. No hiding a badly missed high note! Yup. You nailed that one 100%. Same thing for piano performance – except add sweaty hands that slide over keys too easy, and crowd noticing for sure all of the shaking limbs. Antlers was laugh out loud funny. Next time I’m called on to public speak, I know I’ll be thinking about them. Thanks Jenn! The antlers thing has been freaking me out for years. It’s even more frightening during hunting season. I love the descriptions. Especially “antlers of pain” bit! Perfect mental image. I don’t have to publicly speak anymore, but back when I did, I was a speed machine. Teachers would have us clock our speeches, to make sure they were long enough. When just timing it, I’d be fine, but when I presented, I could do a 5-minute “calm” presentation in about 2 minutes 40 seconds! I once tore through a 15-minute presentation with a full 6 minutes 50 seconds left! The odd thing was, people understood me. They always looked shell-shocked, but could remember my points. I try to find comfort in the idea that they won’t remember what I’m saying! I cannot begin to tell you of the sheer terror that I have of public speaking. I’m ok reading someone else’s words (like when asked to read at someone’s wedding), but if I wrote it, forget it. I’d rather eat fugu from a street vendor! Presentations in college were an absolute nightmare for me. Would work out a deal whenever roped into a group project, i.e. I’ll do the spreadsheets and powerpoint slides, YOU do the talking! Thanks for sharing your feelings on the subject! Good to know I’m not the only one that gets this way. 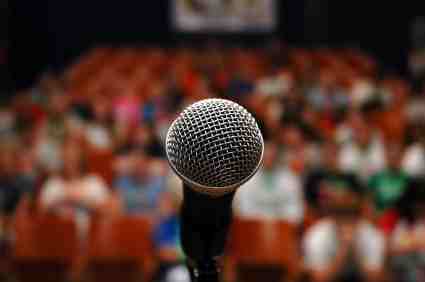 Several studies say that public speaking scares more people then dying. I once heard someone say that this means that the person giving a eulogy at a funeral is better off than the corpse. I can relate to this. Sounds like you can too!!!! First timer here. Good mix of honesty, imagery, and with a sense of humor. A bit of advice ….DRUGS …. see your doctor … DRUGS. Honestly, my wife is worse than you. See takes something before giving a presentation to a group of co-workers. Xanax? Welcome to the neighborhood! Glad you dig it! I thought about getting something for it, but the last thing I need is to be drooling with a pair of antlers sticking out of my head. My wife has said that it definitely relaxes her, but feel more tired than normal by the end of the day. I’m a former trial lawyer and recovering litigator. I’m used to speaking in public and I’m giving a lecture at a national conference in a couple weeks. I’m usually fine and look forward to opening my mouth. Ha!!! If you do happen to sprout antlers, please send me a video. I mean, that would be pretty cool to watch. Don’t send me a video if the other thing happens though! This one is one of my favorites, Keith. While I don’t mind speaking quite as much as you do, I have always wondered about the blinding pain I occasionally get in my skull. Sprounting Antlers! Brilliant! Sadly, I also get that you can be too big to fall. There are very few coworkers who could catch me without needing additional medical attention. I told a friend of mine who studies anxiety about the antler pain and she was fascinated and never had heard of the symptom. Maybe you and I will end up in the DSM filed under “Antler Pain” or maybe we are descended from deer. My experience is on a smaller scale. A lot smaller. And this is why it worries me. I felt ashamed because my way of coping with the terror I felt was to cry and I told myself I could not go on with the practical course and immediately voiced my concerns with my manager. She was very supportive but was sure the best way was to face that fear head on. I disagreed, but tail between legs returned to the training room, embarrassed because I’d obviously been upset, and carried out the tasks required of me, yes alittle wobbly but I ended up talking too much. I passed it. When I got home I felt deflated and even though I’d faced a huge fear, I felt ashamed that I got upset about it. So I didn’t come out from this experience feeling positive I’d passed, just wary that some day I’d have to repeat this all again for something else. I think you did a really good job of explaing what is going through peoples minds who suffer from glossophobia when they get on stage. Keith if you are interested in learning more about how to cure your fear of public speaking have you tried http://curefearofpublicspeaking.com/ ? I frequently visit the site to look at guides and tips before my speeches! I’m working on some things and I’ve really improved in this area since I wrote the piece, but I always can use help. Thanks for the link!